It is worth noting that perilla is a very attractive plant, often grown simply for its ornamental value. It resembles a coleus, and indeed displays of it are sometimes marked This is not a coleus! The more sun it gets, the more colored up it tends to be (though that may apply more to the red perilla than to shiso). At this stage, cultivars beyond the color differences seem unknown to U.S. seedsmen, who usually list the plant in their “herbs” sections as just “Green perilla”. Perilla is a warm-weather plant, and its culture is apparently simple: direct-seed it when frost risk is past, say around June 1st. Figure on the traditional square foot per plant. Beware! perilla is highly invasive, so do not let it drop seed! It grows as an aggressive weed throughout eastern North America. On the other hand, it makes an excellent container plant, and that is how we will grow it. Though one grows it for the leaves, the flowers are also edible, and might make a pleasant garnish. As with any potherb, to use it in salads, pick the leaves when still young and small (pick from the top of the growing plant). Perilla that is peculiar herb of Japan - a very good overview, from Japan. 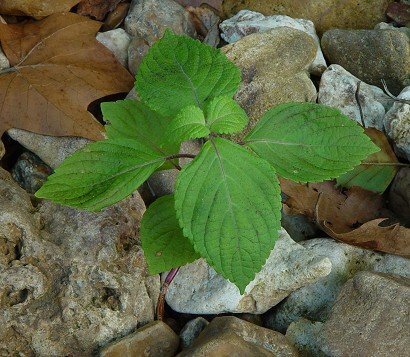 Perilla is a member of the Labiatae family, a very large one that includes many common herbs: the basils, the mints, lavender, hyssop, pennyroyal, lemon balm, horehound, and several less-known species. The history of perilla/shiso is not much discussed on the web. It appears to have been a staple of the Japanese diet for millennia, dating from sometime in the Jomon Era—which, regrettably, is a sorta wide window: 8000 B.C. to 400 B.C. In Japan, perilla leaves are sometimes used as a pizza topping. You loaded this page on Friday, 19 April 2019, at 16:43 EDT. It was last modified on Monday, 4 February 2019, at 19:03 EST.